We’ve done all of the leg work for you and have created this list of the highest-rated, most trusted tile and grout cleaners Perth has to offer. Save yourself precious time and take comfort in the knowledge that when you call one of the companies listed featured below, you’ll be dealing with professional cleaners who will go the extra mile to get your tile and grout looking brand new. 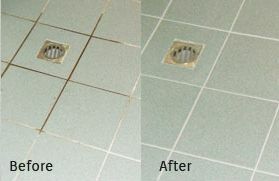 We are currently vetting Tile and Grout Cleaning Companies that service the Melbourne area. If you would like to nominate a company that provides superior service and value let us know. Turbo Force provides complete and professional tile and grout cleaning, protection and restoration services to residential and commercial properties throughout Perth Metro. They are committed to complete customer satisfaction, providing fully trained and experienced technicians who are capable of handling the toughest jobs. They use the latest deep-cleaning products and technology, and take pride in getting the job done right the first time, every time. The Ultimate Clean has built a large following of satisfied customers who look for and expect only the highest quality tile and grout cleaning in Perth. They use environmentally friendly, neutral and biodegradable products whenever possible, significantly reducing the chance of damage to your precious tile floors and surfaces. A1 Carpet, Tile & Grout Cleaning is a family-owned, professional cleaning company providing premium, high-quality service to clients across Perth Metro. They are available for booking 24 hours a day, 7 days a week. Anytime you need them, their expert technicians will be there to help you. ProtectorClean is Perth’s carpet and hard surface cleaning and sealing specialist. They use a unique high-pressure, high-heat, and vacuum recovery system that removes years of grime and dirt build-up from your tile and grout while also removing all traces of water and chemical debris, leaving your floors and surfaces ready for use the moment they are done. Accredited by the Carpet Cleaning Association of WA, Expert Carpet Cleaning is a leading floor tile treatment professional that specialises in tile and grout cleaning and sealing. They use high-pressure, van-mounted cleaning equipment specifically designed to clean your grout and tiles without any mess. By using the latest techniques, fully trained technicians and good old fashioned service at an affordable price, Perth Carpet Cleaning provides one of the best tile and grout cleaning services around. They are solely focused on getting the absolute best result possible for you, and are so confident in the quality of their work that they offer a 100% satisfaction guarantee. Turbo Force will remove the dirt, grime and bacteria from all types of natural stone, porcelain, and terracotta tiles and surfaces. They use a variety of cleaners designed for safe use on different types of stone or tile – from pH neutral to alkaline heavy-duty degreasers, they will have the just the right product to ensure your surfaces get the deepest clean without damage. They also offer a number of sealing options from stain resistance, colour rejuvenation and anti-slip treatment. With the right protection your tile and grout surfaces will last longer, stay cleaner, and require less maintenance, extending the life of your investment. Finally, Turbo Force’s restoration services are second to none. Their grout, silicone, and tile replacement and restoration will significantly improve the look of your surfaces, giving you the joy of a brand new home or business. For light stains, simply start with plain water and a stiff-bristled brush. Most hardware stores will carry an assortment of brushes specifically designed for this purpose. Simply spray warm water on the grout and scrub in a circular motion. For moderate stains, try using some hydrogen peroxide. You can use the product straight or mix it with baking soda to make a paste to scrub in, rinse and wipe off. For tougher stains and really grimy grout, try using oxygen bleach. Generally, you want to let the oxygen bleach solution for 10 to 15 minutes before rinsing. Be sure to always rinse with clean water so that the dirt doesn’t resettle into the grout. To keep your grout clean and stain-free throughout the year, it is a good idea to spray it with vinegar and wipe it down once a week. You can also wipe grout with alcohol to keep mold and mildew from forming. With any cleaning project, it’s always best to start off with the mildest cleaning solution. When in doubt about one of the home solutions above, test it in a hidden spot such as under or behind an appliance.